I recently received two queries from Dave T on my article "Back to basics: the front kick". Because the queries raise quite important points I thought I'd canvas them more completely (and hopefully more clearly) as separate blog articles rather than as a reply in the comments section. "What is your opinion of the TKD style front kick where the ankle is fully locked so that the instep and shin are in one straight line and the toes curled up? At the chamber position, the feet points down except for the toes. For high targets, won’t this method give the maximum penetration? I find that when using the karate method of the feet parallel to the ground during chamber for high targets, the sole or heel hits the target instead of the ball, thus removing a lot of the power from the kick. The position of the feet during chambering has to be adjusted for targets at different heights to achieve maximum penetration. 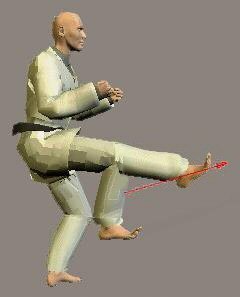 Problem with the TKD version is that for lower targets, the toes hit the target first, render the kick ineffective." Dave, I don't see this as a "TKD version". I think it is just plainly incorrect - for taekwondo, karate - you name it. The problem with the ankle down kick is that it can only lead to a scoop. The front snap kick is a straight kick not a scooping kick. Have a look at the adjacent image and you'll see the problem. 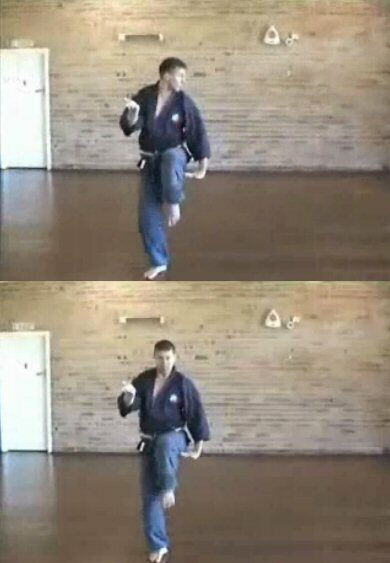 With the toes down (and ankle down), you can use a scooping kick as an attack to the groin using the shin or instep (known as "kin geri" in Japanese). But with the toes pulled back (and ankle down), it makes almost no sense. The biggest problem is that it puts the tops of your toes (rather than the ball of your foot) in prominence. It is true that, when such a hybrid kick is done very high, the scoop will ultimately put the ball of foot in prominence. But what would be the target for such a kick? Under the chin? I can think of a hundred kicks that are more effective/useful than this - and that are less dangerous. Because while such a "scooping ball of foot" kick might be effective at its final point, at every preceding point of the kick your toes are in danger of being broken. In other words, if you happen to encounter an obstacle at any point leading up to the high contact, you will hit with the tops of your toes. Indeed, this happened to me once. I got into a fight and had the grand plan of kicking my opponent in the face. My kick at the time was very poor, with a "scooping" action. Needless to say, it never passed his shin (which he raised in defence) and I broke 2 toes. I demonstrate slow front kicks. Note the movement of my ankle during the kick. This movement ensures that the ball of the foot is presented as the contact surface, not the sole or heel of my foot. So my advice is to chamber your ankle so that it is level because you want a linear kick not a scooping one. This is true regardless of the height of your kick. "But I don't find my 'ankle down chamber' causes a scoop!" "When performing mae geri, my ankle is extended, and quite consciously so. I find no impediment to perfoming an effective, penetrating chudan mae geri [chest level front kick]." My answer is this: try locking your foot into the extended posture - without any flexibility in the ankle (eg. in a plaster cast) and try to kick with the ball of your foot. You will find it is physiologically impossible to do anything but a scoop - as my picture shows. Accordingly I suggest that what is happening is that in between the chamber and kick (ie. while the leg is extending outwards) the ankle is rotating up to present your ball of foot. There simply must be some movement of this kind in the ankle otherwise you will scoop - and you risk contact with, and breaking, your toes on impact unless your distancing is absolutely perfect (in which case you still have a sub-optimal kick that happens to contact with the ball of your foot, albeit with a "scooping" moment). I don't recommend "late rotation"; if you're doing it (and you almost certainly are doing it when you have an extended chamber, even if you're doing it unconsciously), then you're leaving the ankle rotation very late - and the problem arises (as I found) when you encounter an obstacle (eg. raised knee) early in your outward extension. A late ankle rotation upwards from an extended chamber also compares poorly with a rotation downward during the extension of your kick. When you rotate down your chances of impacting your toes are greatly reduced. An ankle rotation upwards means that your chances of impacting with, and breaking, your toes are greatly increased. We've found the latter to be true during our "kick touch" drill; a late upward rotation of the ankle increases your chances of broken toes when the drill is mistimed slightly and there is an impact (which can happen when it is performed quickly). Our kick touch drill. Don't try this with an extended ankle chamber! "But 'ankle down' chamber is part of a powerful push-off!" If I see students with their toes up in chamber, I know they didn't push-off the ground, but only yanked up with their hip." "I am personally a proponent of the foot parallel to the floor chamber, but I am not sure why pushing off the floor with the kicking foot prevents this chamber from occuring. As the foot reaches the full chamber point the foot should be able to reach parallel... the push off is not a full extension of the foot/ankle but an explosive shorter movement and is then pulled up. It stays there as the foot is extended and then the foot extends as contact is made depending on the distance. This also gives me the option (which I utilize frequently) to use the heel as a striking surface for the front kick. Depending on distance and kick placement I may opt for a strike with the heel, ball of the foot, or toes." I agree completely with Marcel. I push-off quite vigorously but it doesn't mean I have my foot at full extension at any time, and particularly not in the chamber. And I find the travel from ground to chamber gives more than enough time for the "pull up" after the initial push off. The footage of Higaonna sensei showing push-off from the ground is something we practise too. We use this for "hiza geri" (knee kicks) particularly in the kata saifa (see the adjacent pictures). But you'll note that when the kick transfers to a mae geri (front kick) the ankle lifts to horizontal as soon as possible. they are unaware that their ankle is actually rotating mid-flight to present the ball of foot. The problem with the latter is that it requires you to rotate a great deal more, and a great deal later, than you need to. It also requires you to rotate your ankle up instead of down during the extension of your kick. All this leaves you at a greater risk impacting with, and breaking, your toes. Nor does a front kick require a push-off such that you end up in a downward chamber. For a start, the push-off simply doesn't require that level of extension in your ankle; the majority of the power of a front kick is delivered with a snap or flick - which comes at the end - not with the initial "drive". The situation is different for hiza geri (knee kicks) where the initial drive is all you have. So in the latter case, your ankle should be down - but then again, so should your toes! Secondly, there is ample time for your ankle to return to a horizontal plane before you kick out. So for a front kick you can and should chamber your ankle horizontally - to avoid the potential for scooping, late (and inappropriate) rotation of the ankle and accordingly broken toes. Thanks for taking the effort to give such a long, detailed reply. 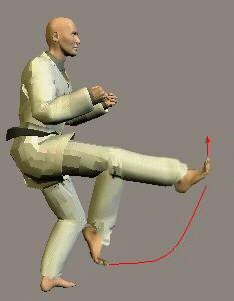 On a sidenote, if you look at TKD instruction books, most show the front kick chambered in the straight line (shin and instep) with curled toes manner. I have no hesitation in saying that those manuals are manifestly incorrect; some details are a matter of logic, not style. Taekwondo is, historically, a system descended from shotokan karate. While some concepts have evolved (and new forms have been developed) the basics are built on exactly the same foundations. For that matter, the same chamber is found in Chinese martial arts (albeit that front kicks in those arts are more often done with the heel - but there are certainly toe kicks, which are of the same family as ball of foot kicks). There are some biomechanical issues that transcend all styles. This is one. A kick chambered with shin and instep in a straight line leads to a scoop (and, as I discovered) broken toes. It confers no advantage. There is simply nothing you can't do with the proper chamber that you can do with the "scooping" chamber. However the reverse most certainly does not apply. People often take me to task about referring to "dilution" of traditional knowledge. This would be a prime example. One instructor has poor basics, then passes it on to his/her student - then before you know it, it is "part of the style". No, it isn't. It is the hallmark of someone not knowing their basics properly, and passing it on to the next generation. I've dedicated my blog to reversing this trend - by analysing movements and arguing my case with basic anatomy, physics and simple logic! I hope I have managed to do so here! Here's another Taekwon-Do perspective. I cannot speak for other versions of Taekwon-Do, but as for ITF Taekwon-Do and Moo Duk Kwan Taekwon-Do (the two systems I am most familiar with), the sole of the foot is kept mostly parallel with the floor throughout the motion, with the toes pulled back. The ball of the foot is the attacking tool and the flight path is as straight as possible, not a scoop. In other words, exactly like you explained Dan. Also, the front kick is seldomn used any higher than one's own mid-section (solar plexus level) to prevent a scooping motion. The ITF Encyclopaedia does mention an exception where a slight arc (scooping motion) is used and the instep rather than the ball of the foot is employed: an attack to the scrotum. Finally, as far as I can tell there is no front kick in Taekwon-Do where the bottom of the heel is used. The closest to this is a front checking kick, used as a "buffer" technique for an opponent rushing in. The sole of the foot is used as the blocking tool. Yes, the "kin geri" (instep kick to the groin) does indeed have a scooping action - as it should. I don't know that I agree that "the front kick is seldomn used any higher than one's own mid-section (solar plexus level) to prevent a scooping motion." I think there is nothing preventing a high front kick from having a (relatively) linear path, provided you raise the knee appropriately. Other than that, I would agree with keeping front kicks low for purely pragmatic reasons - you spend less time with one foot in the air, and you focus on bigger, easier to reach targets (the lower abdomen). That said, a front kick to the face is most effective! A vid here of Master Alexandris (ITF)teaching the front kick . You cant hear him due to the crappy music but its a standard front kick (foot parallel to the floor). Also you can see him teaching the dangers of scooping with high level kicks. I find it impossible to kick to the high section without some scooping, though kicking upward into the chin/face is pretty effective alright. A friend of mine (with no training at all)ended a fight before it began with a front kick to the face: knockout + two teeth extracted.